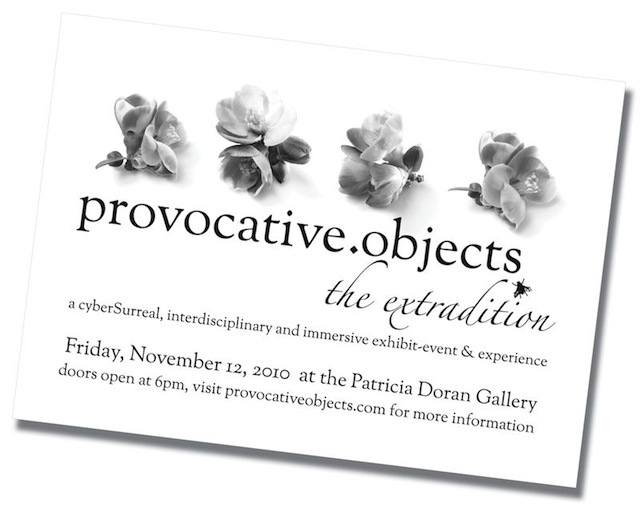 You are cordially invited to attend provocative.objects: the extradition, a cybersurreal exhibition + event on Friday, November 12th at MassArt in the Patricia Doran Gallery. The event is scheduled to start at 6 p.m. and end around 10 p.m., after which we’ll gather at a local watering hole. provocative.objects: the extradition is co-curated by lou suSi and yours truly, working with the Bureau of cyberSurreal Investigation. Together we have selected for you a collection of works by a diverse array of artists, designers, and performers. Come experience an immersive sound installation, interactive sculptures, live performances, a video loop, and music, along with an assortment of tasty snacks and beverages. this one-evening exhibition/event will close with live music by local rockers stereo soul future, featuring christopher field. Exhibiting artists include: Phillippe Lejeune, Ellen Godena, Alberto Negredo, Alison Kotin, Chris Basmajian, Christopher Field, Colin Owens, Courtney Brown, Courtney Lockemer, cyber sir eel kolectiv, Daniel Buckley, Daniel DeLuca, Dwayne Butcher, Elizabeth Mead, Ellen Lake, Joseph ‘Puppy’ Wight, Joshua Dolby, David Tames, Laugh Foundation, Laura Amador, Lauren McCarthy, Leigh Wells, Lewis Gesner, lou suS, Mary Rachel Fanning, Mauri Lehnoten, , Scott Murray, Stacy Scibelli, and X Y. The event is presented under the aegis of the Dynamic Media Institute (DMI) at the Massachusetts College of Art and Design. DMI offers a creative environment wherein graduate students from many disciplines explore the evolution of interactive art and communication design through new media. Through events like provocative.objects: the extradition, students, alumni, faculty, and friends of the program explore interactive storytelling, documentary, dynamic media design, video games, performance art, musical composition, and more. I hope you will be able to join us for this special evening, for more information, point your browser to provocativeobjects.com (the site is evolving and will become the exhibition catalog by the end of November).